The avalanche danger is CONSIDERABLE on and below the steep, wind drifted slopes at the upper elevations. This means human triggered avalanches are likely and natural avalanches possible. The avalanche danger is MODERATE on wind drifted slopes at the mid elevations. Some avalanches may be triggered at a distance or from below. Be aware of what is above you, and avoid travel in avalanche runout zones such as the bottom of gullies and couloirs and travel below slopes being loaded by the wind. Hell's Canyon is a prime example of a gully and avalanche run out zone that is the type of terrain that should be avoided today. The growing cornices are unstable, and will break back further than expected. Seek out terrain without wind-drifts or wind slabs. Wind sheltered, mid elevation terrain has a much lower avalanche danger (and much better turning conditions!). The body of snowmobiler Bradley Stapley was recovered from an avalanche near Circleville Mountain in the Tushar mountains yesterday. Our deepest condolences to his family and friends. A preliminary accident report is HERE. This is the third avalanche fatality in Utah this winter. The southerly winds cranked up yesterday - strongest in the Ogden area mountains as usual. Ridge lines averaged to 40 to 50 mph, and gusted into 60s. The winds were getting well down into the mid elevations, with averages to 25 mph, and gusts to 40 mph. Today, increasing clouds and continued moderate to strong, southwesterly winds, peaking midday. A small storm that will give the mountains 2 to 5” of snow starting late this afternoon through about midnight. Temperatures will warm into the mid teens at the upper elevations to mid 20s at the mid elevations. A stronger storm will bring more snow Sunday night into Monday. In the Ogden area mountains, resorts reported widespread wind slabs forming, both along ridgelines and well down into mid elevation terrain. Both soft and hard wind slabs, small natural wind slabs and cornices released naturally and with ski cuts. To the south, non-stop avalanche activity yesterday, with the focus on wind drifted slopes facing north through easterly. Check out the Salt Lake and Provo forecasts if you are heading that way. Sharp Mountain (private land) - to the north of James Peak, had a very interesting avalanche. A remotely triggered hard slab on a northwest facing slope at 8,600', breaking near the ground on facets 4 feet deep and 300' wide. The widespread, new wind drifts are the number one avalanche concern today. Moderate to strong southwesterly winds have drifted the snow at both mid and upper elevations into soft to hard drifts. The cracky drifts will be easily triggering on steep slopes, and it will be possible to trigger these new drifts from a distance or from below. Drifts will be most widespread on north through southeasterly facing slopes. However, the winds can deposit snow around terrain features on almost any aspect, called cross loading. Human triggered avalanches are likely today on wind drifted slopes and natural releases possible as today’s wind continues to drift the snow. Cornices are growing and very sensitive, and will break back much further than expected. Give them a wide berth - travel well back from the edges of ridge lines and avoid travel beneath them. I am not sure what to think of this avalanche triggered yesterday in the "transitional zone" between the Ogden area and the Logan area mountains. Currently, it's a "one of a kind" avalanche for the Ogden area mountains. But scary and not to be ignored. 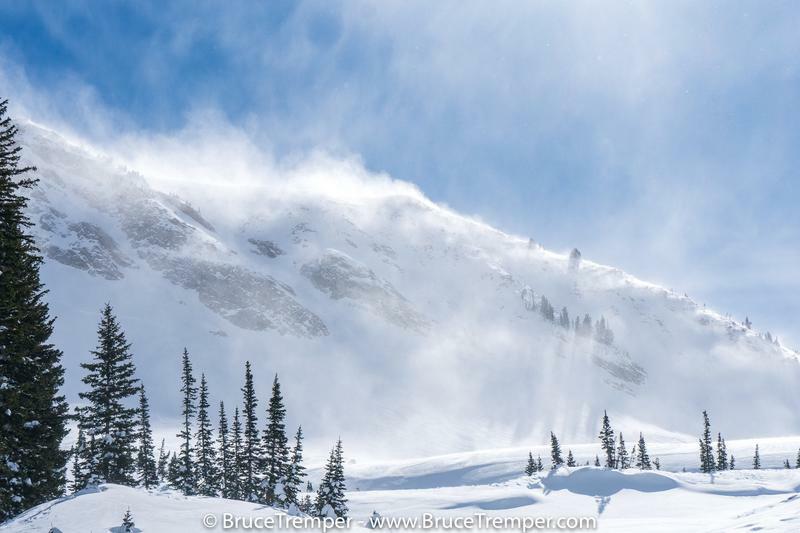 Multiple snow and wind events mean we are starting to get unusual avalanches, and there is the chance that there are other slopes with a similar snowpack. Evaluate all steep slopes carefully - perhaps this was a slope with a shallow snowpack that had faceted, and then was heavily wind loaded this week.